These two little half-sister donkeys live life at the intersection of late childhood and early eccentricity. They bray loudly, especially if their meals are not served on time. They disrupt almost any event with their demands for attention. The shyness they showed when they arrived at Dunrovin Ranch as small jennets didn't last long – everyone's attention naturally flowed in their direction. How could anyone resist their charms? Well, all the fuss went to their heads. 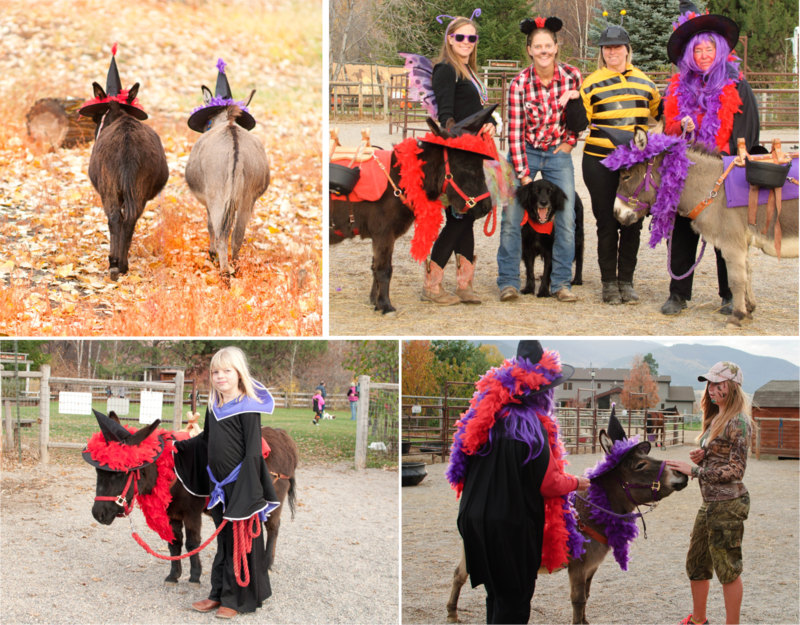 No longer ordinary donkeys, they have donned the mantle of DIVAS and aggressively seek to be the center of attention. Always. In every situation. Unfortunately for the Dunrovin Ranch staff, they are not only demanding, entitled, strong, and quick on their feet, they are more than clever. They are devious and very, very smart. They are always on the lookout for a gate left unattended. They have figured out how to open them all. Dunrovin Ranch has had to resort to fist tight bungee cords in addition to gate latches to keep them from opening their stall gate, escaping, then running around to open all the other equines' gates, and hosting a party in the hay barn. It's happened. And, more than once! And look out barnyard if they are bored. For no apparent reason, they take it in their minds to run about with total mischief on their faces, kicking up their heels, enticing others to misbehave, and creating havoc. Our viewers love them. Everyone loves them - and they know it. Each has her own distinct personality. Miss Gertie was named after ranch owner SuzAnne Miller's grandmother, Gertrude. Like her namesake, Miss Gertie is the older, rather bossy sister. She can be counted on to instigate trouble and fun. She knows no limits. She is darned-sure of what she wants and unafraid to tell you so. Purple is her color, as she believes it adds the right contrast to her lovely gray coat and the dark cross on her back. Clearly, she doesn't think that women need wait until they are older to wear purple. Miss Maude, named for SuzAnne's great aunt and Gertrude's younger sister, adores the color red. Her rich chocolate coat with amber tones comes alive when adorned with red. Miss Maude also resembles her namesake: sweet, agreeable, but with plenty of playfulness and a spark of naughtiness. Whenever the two are caught in one of their escapades, Miss Maude always points the finger at Miss Gertie. One must be careful, however, in believing that Miss Maude is always so innocent. Our webcam viewers know the truth and have snitched on her. Naturally, the DIVAS don't just stay home hoping for fans and adventure to come their way. They are women who get out and about. 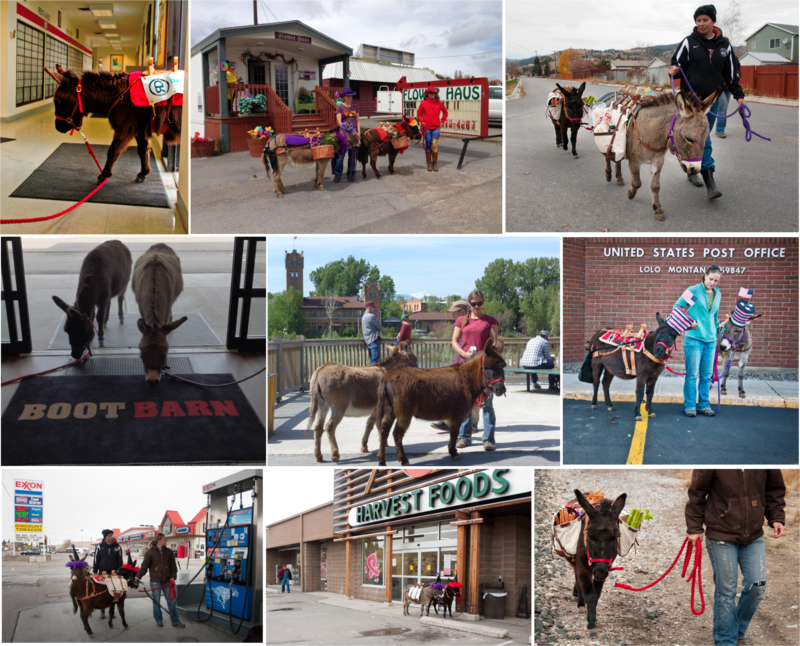 Happy to go grocery shopping where they cause a stir with other shoppers, to visit local farm-and-ranch supply stores to help them advertise, to drop valentines and letters off at the post office, or to parade around Lolo to help get out the vote. You can count on these ladies to do their parts. Holidays are their favorite, of course. Halloween and Christmas top the list for them. They love to carry candy in the pots attached to their sawbuck saddles to hand out to children and spend days before Dunrovin Ranch's annual Halloween Party getting their costumes in order. 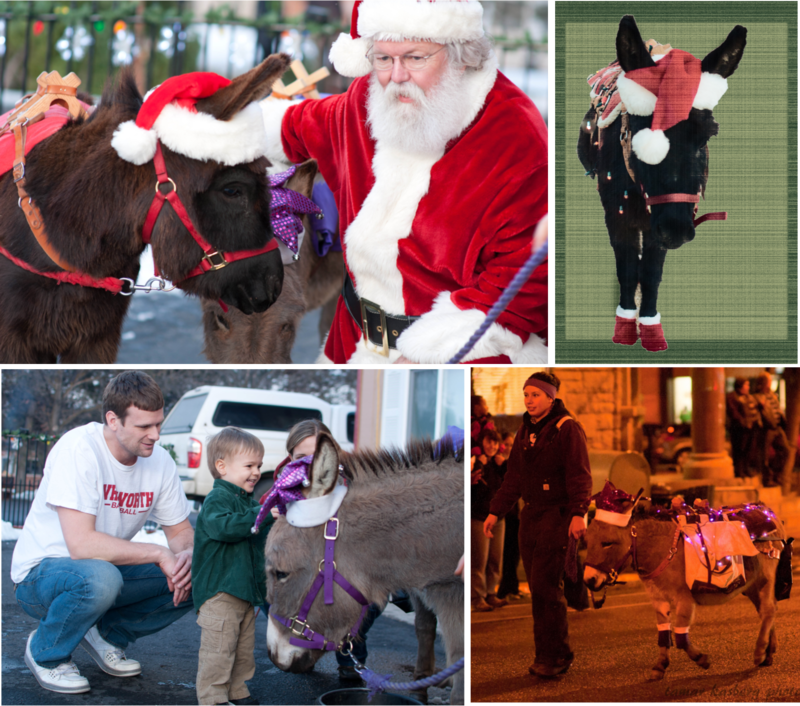 Local businesses vie for their celebrity appearances during the Christmas holiday, when they also strut their stuff at Missoula's Parade of Lights. The Donkey DIVAS hold themselves in very high regard. They contend that they play a key role within the Dunrovin Ranch barnyard - that of animal psychologists, providing their fellow creatures with free, unsolicited, and often nonsensical advice on coping with their human handlers. Humans can be perplexing creatures. However, the DIVAS think of themselves as keen observers and have amassed a treasure trove of clichés, platitudes, and stereotypes about humanity to convince many a wary animal that they know of what they speak - or bray, as the case may be. Having fooled many a Dunrovin animal into listening to them, they have become quite certain that what the animal world needs now is more advice from a couple of worldly and wise asses. Not wanting to be on the wrong side of the DIVAS, Dunrovin Ranch has relented and ceded some space in this website their own advice column. If have no better way to waste your time, check their Animal Advice from the Wise-Asses. 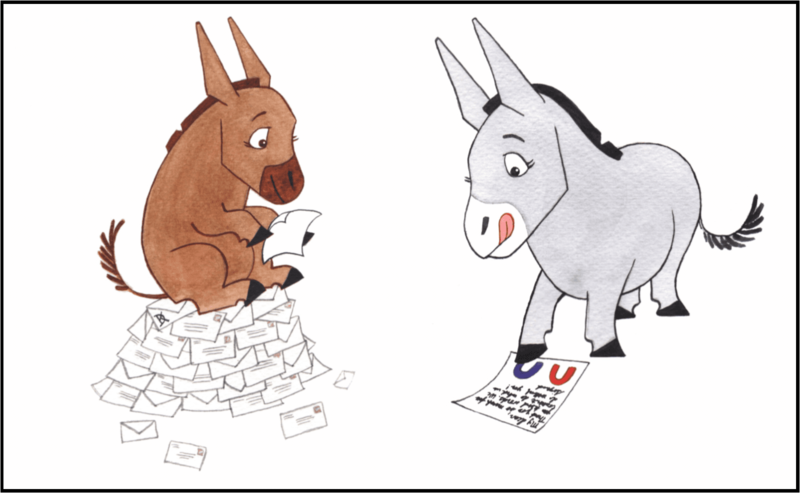 And should you know an animal desperate enough to listen to their braying, just write to them at DunrovinDivas@gmail.com. Dunrovin Ranch cannot accept responsibility for the veracity, suitability, or validity of whatever they write or bray in response. Writers and readers, please beware. The opinion the Dunrovin animals have of the DIVAS does NOT match that of the DIVAS themselves. Few of the Dunrovin animals approve of the DIVAS' efforts to save the animal kingdom from ruin at the hands of humans by dispensing advice. For one thing, our hard working horses are well aware that the DIVAS lead rather rarified existences serving as mascots. No, they don't have to carry riders or pull carts. All they do for a living is visit schools, enjoy fans at local parks, dress-up and present themselves for photos, and strut their stuff in downtown parades. 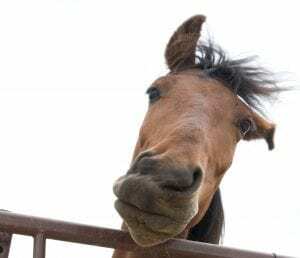 Some, like the equine below, say "Balderdash! The DIVAS can't be trusted and know nothing whatsoever about the troubles of others. Let them get out and work a real job for a change!" Rumors about dishing the DIVAS a little "comeuppance" are flying around Dunrovin Ranch. Ranch hands have been alerted to keep the DIVAS' stall securely locked at all times to not only to prevent them from going on walkabouts looking for adoring fans but to protect them from tricks the rest of the animals may be cooking up. The DIVAS are counting on their charms to defuse the situation. We'll see – stay tuned! Señor Kona was Dunrovin Ranch's first donkey and he set a very high bar. 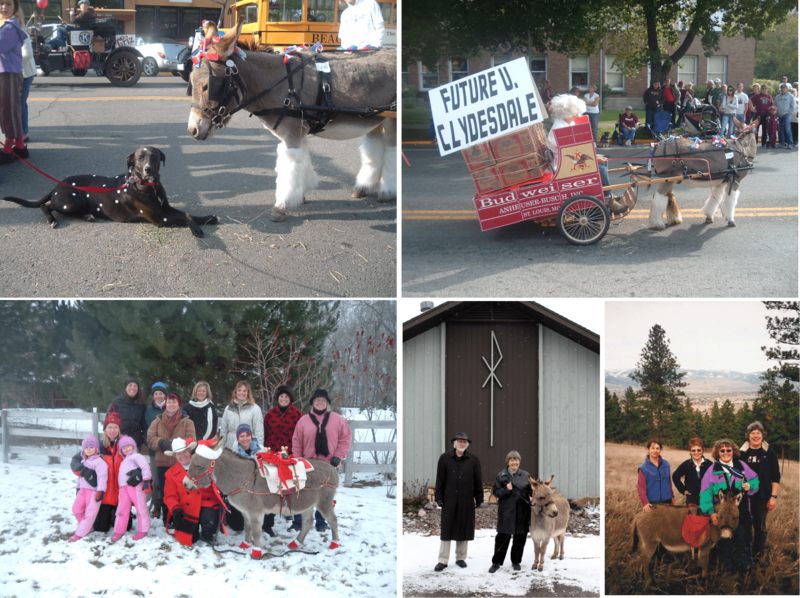 He once won first place in the University of Montana's homecoming parade, he visited local schools and rest homes, and we a favorite at the Missoula Pet Fest. He arrived at Dunrovin Ranch as a foal and immediately bonded with Lady Lonza who was also a foal at the time. They were the "odd couple" or "beauty and the beast" and were forever together. It all began with a work trip. As a research consultant for various natural resource management agencies, I frequently traveled across Montana for workshops and meetings. Whenever I was asked to take a project that would require me to spend more than a couple of days in another Montana community, I tried to include some horseback riding. After all, what is the point of visiting some spectacular part of Montana without a horse? My clients were often asked to help find suitable housing for my horse so that I could ride him when not working. These requests were frequently met with silence on the telephone – then, quizzically, “A horse?” While it did impose a rather unusual requirement on prospective clients, it nearly always ended in a very worthwhile adventure for me. Since most of my clients were natural resource professionals, they were always well acquainted with local ranchers, and that acquaintance was generally the solution to my unorthodox contract requirement. It also had the benefit of me forming some wonderful friendships with ranchers across the state. 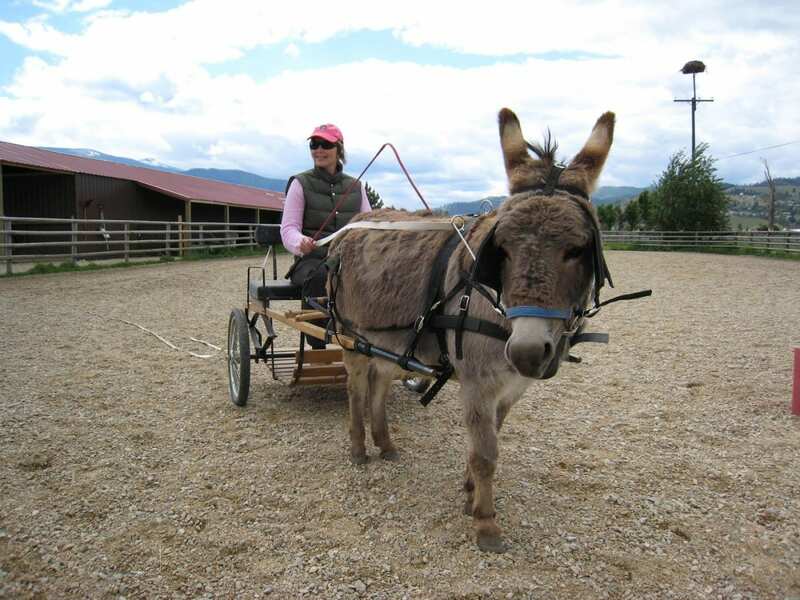 On one such trip to the Bozeman area, I housed my horse, Power, at the Gallatin River Ranch. At that beautiful ranch, there lived a charming jack donkey (i.e. stud!) named Onk. Onk was very social and immediately began to hang out with me and Power. Every evening, he would follow me on the trail as Power and I made our way to the top the ridge overlooking the ranch. There he would stop, look down at the barn, glance at us, then nod his head as if to tip his hat, and head back to the barn. I was completely smitten. Upon returning home, I explained to my family how I had fallen in love with this incredibly handsome and charismatic donkey and wondered about getting one for Dunrovin. Silently, my husband and two young sons just stared back in disbelief. 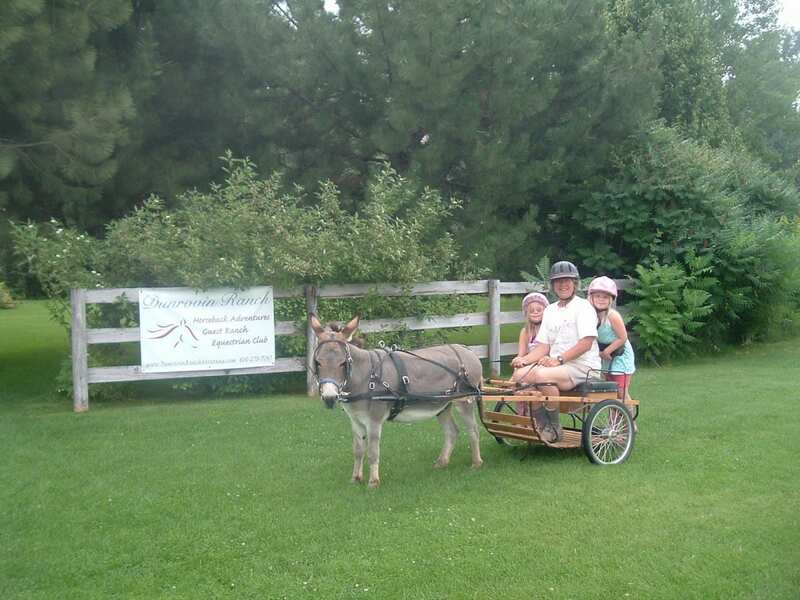 “Why, exactly,” they asked, “would Dunrovin need a donkey?” And, my reply was, of course, “For comic relief!” The lack of a firm “NO WAY!” from the family was taken by me as a resounding “YES!”, and I promptly called the ranch for more details about Onk and his origins. As luck would have it, Onk had – the summer before – bred a lovely little jenny at a ranch near Twin Bridges. That breeding had produced a little jack that was only 3 months old and for sale. It took only one photo and one phone call to seal the deal. 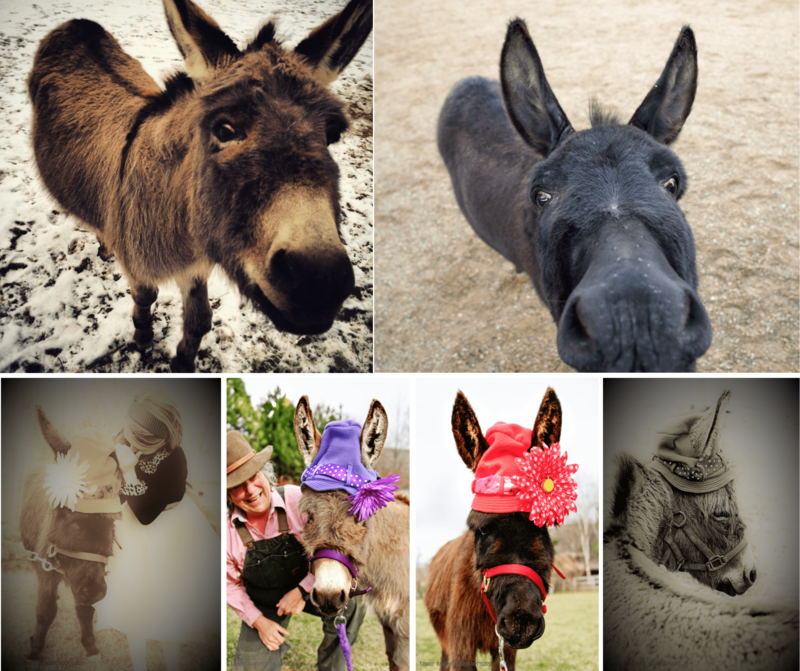 Dunrovin’s first donkey, Señor Kona, more than lived up to his billing as “comic relief.” He soon became Dunrovin’s mascot, loud morning greeter, mischief maker, and the Lovely Lady Lonza’s ever-present side kick. Señor Kona brought a smile to every face and enchanted every child. He was a man about town – visiting schools and nursing homes, pulling a decorated cart, riding in the back of my van, wearing a sawbuck saddle filled with candy treats, winning a prize in UM’s homecoming parade, dressing up for Christmas and Halloween, letting little ones pin velcro tails on his ample rump, and teaching kids about leadership through his “donkey challenge” games. His unquestioning trust, playful antics, and sheer exuberance reminded us all that love and joy take many forms and come from many places. His sudden death left a huge hole in Dunrovin’s heart and soul. The mornings became too quiet; there was no big nose and big ears pushing into the tack room in search of treats; Lady Lonza stood silently near his stall with her head hung low. He graced our Dunrovin Ranch sweatshirts as a Montana Legend – and that he most certainly remains – a legend to us all. About a year after Señor Kona’s passing, I heard of two little jenny donkeys on a ranch near Lewistown. One was the typical gray with a dark cross on its back; and the other was a chocolate brown with an even darker cross on its back. They were half-sisters out of the same jack: one was 6 months old and the other was 9 months old. This time the question of why Dunrovin needed TWO donkeys didn’t even come up. Of course, Dunrovin needed these two – and we are ever so grateful to have our lovely Divas grace us with their presence. Miss Gertie, the oldest, is named after my grandmother, Gertrude; Miss Maude takes the name of Gertrude’s younger sister, and my favorite great aunt. There is no doubt that Gertrude and Maude smile from heaven with every antic the Divas serve up at Dunrovin. I am certain that Grandma Gertrude and Aunt Maude would see the Divas as sister souls – embracing life, spreading good cheer, and dressing for every occasion.